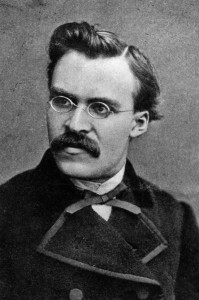 Friedrich_Nietzsche- "No price is too high to pay for the privilege of owning yourself." Insanity in individuals is something rare- but in groups, parties, nations and epochs, it is the rule. At times one remains faithful to a cause onlye because its opponents do not cease to be insipid. Talking much about oneself can also be means to conceal oneself. The advantage of bad memory is that one enjoys several times the same good things for the first time. The individual has always had to struggle to keep from being overwhelmed by the tribe. If you try it, you will be lonely often, amd sometimes frightened. But no price is too high to pay for the privilege of owning yourself. The overman…Who has organized the chaos of his passions, given style to his character, and become creative. Aware of life´s terrors, he affirms life without resentment. The visionary lies to himself, the liar only to others. To forget one´s purpose is the commonest form of stupidity. To predict the behaviour of ordinary people in advance, you only have to assume that they will always try to escape a disagreeable situation with the smallest possible expenditure of intelligence. When one has much to put into them, a day has a hundred pockets. When you stare into the abyss the abyss stares back at you. But thus do I counsel you, my friends: distrust all in whom the impulse to punish is powerful! Digressions, objections, delight in mockery, carefree mistrust are signs of health; everything unconditional belongs in pathology. Only sick music makes money today. In Christianity neither morality nor religion come into contact with reality at any point. What is good? All that heightens the feeling of power in man, the will to power, power itself. What is bad? All that is born of weakness. What is happiness? The feeling that power is growing, that resistance is overcome. Christianity is called the religion of pity. Morality is herd instinct in the individual. To find everything profound- that is an inconvenient trait. It makes one strain one´s eyes all the time, and in the end one finds more than one has wished. We are always in our own company. The most perfidious way of harming a cause consists of defending it deliberately with faulty arguments. For believe me: the secret for harvesting from existence the greatest fruitfulness and greatest enjoyment is- to live dangerously. I would not know what the spirit of a philisopher might wish more to be than a good dancer. A thinker sees his own actions as experiments and questions- as attempts to find out something, Success and failure are for him answers above all. Out of life´s school of war: What does not destroy me, makes me stronger. For men are not equal: thus speaks justice. I am a law only for my kind, I am no law for all. It is nobler to declare oneself wrong than insist on being right- especially when one is right. Not by wrath does one kill, but by laughter. Is man merely a mistake of God´s? Or God merely a mistake of man´s?